Charms and Clovers online slot is overflowing with Irish myths. You have probably seen many slots with a similar theme already, but it is a theme that works! The Irish and their good luck makes for a convincing theme; BetSoft capitalised on it and came up with Charms and Clovers. Released in 2016, the game is a 3D progressive jackpot with major winning potential. It contains four bonus games that we discuss later, fantastic graphics and sound quality; creating a superior online gaming experience. Read on for more about this game. The game is equipped with the regular symbols, K, A, Q and J; but you can look forward to unique symbols too. True to the theme of the game are the unique symbols, four-leaf clovers, horseshoes, mugs, pots of gold and rainbows plus the lucky leprechauns. Lastly, for the wild, the game transforms the letter symbols to gold with clover in the background. Gameplay is pretty straightforward; you will find all the necessary buttons with ease as they are clearly marked. In other words, you will be able to adjust the bet level or coin value easily. Golden Bonus: when you achieve this bonus, you are taken to a second screen where you will need to choose one out of five gold pots. The prize in this bonus is up to 20x your wager. Pots of Gold: in this bonus round you will get eight free spins; with each spin, you get three more wilds added to your reels. 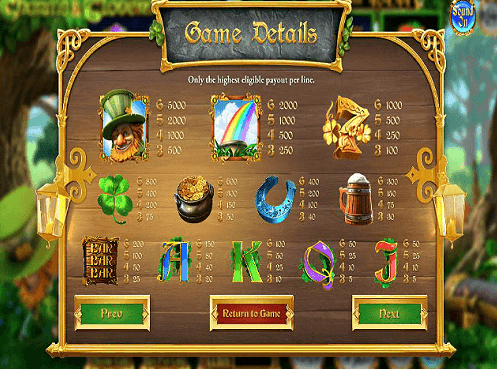 Leprechaun Mega: this bonus gives you eight free spins and adds the bonus symbol to the reels. Money Wheel: this bonus feature allows you to win 15x your wager or gain entry to the four jackpots. These jackpots are mini, giant and colossal and are found on the mega wheel. Players and critics have noted that this online slot gets extremely volatile as the game progresses. But as a medium variance online slot, Charms and Clovers are a go-to for both low and high rollers! We think that the Irish are known for their reason for a reason. Hence, we suggest you try any one of the recommended Pokies.com online casinos to play this game at today.